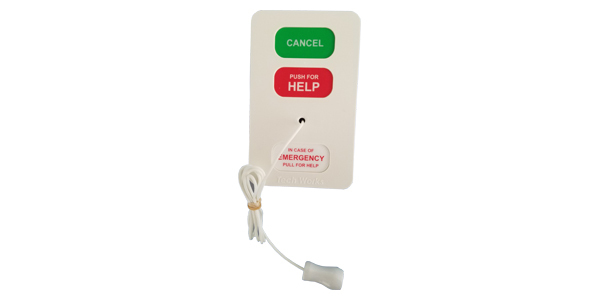 The Tech Works EPS is an Emergency Pull Station in a semi-flush ABS plastic enclosure for durable emergency signaling. A braided nylon pull cord provides the patient with call- for-help access when they may not be able to reach the station. A convenient Push for Help button is also included for activating the Call directly at the station. Staff is provided with a distinctive “CANCEL” button to reset the station. An integral call confirmation LED notifies the user that a call for help has been sent. The Call Assurance Light will be Off if no call is pending, glowing steadily if a Normal Call is pending, and flashing if an Emergency Call is Pending. This is a passive button-and-light assembly designed for use with active stations like the CC-DL-44-B Dome Light or the CC-CM-4 Control Module. Screw Terminals provide wiring connection to the active electronic stations that provide signaling and control for the EPS. Mounting is a standard 1-gang electrical box. An integral back plate provides mounting and adaptor alignment for the EPS.